To be completely honest, the longevity of Swedish war-themed metallers Sabaton continues to amaze me. I first learnt of the band through their sophomore album Primo Victoria and I clearly remember my younger self thinking, “Well, this is neat, I wonder how long they’ll last.” That was nine years and five albums ago, and the band’s popularity has sky-rocketed since then, and it doesn’t seem like Sabaton’s popularity is going to wane any time soon. After the suitably pompous Carolus Rex, a lot has happened in the Sabaton camp, the biggest shock being the departure of both guitarists and drummer, leaving vocalist Joakim Brodén and bassist Pär Sundström to pick up the pieces. During the tour for Carolus Rex new drummer Robban Bäck decided to leave as well, with Snowy Shaw (Mercyful Fate / Therion) filling in. To say that Sabaton had a smooth ride ever since 2012 would be anything but the truth. The good news, however, is that the new line-up has been stable since last year, and that the songwriting has so far been handled by Brodén and Sundström, which means Heroes does not differ much from the band’s previous albums at all. The first thing you’ll notice about Heroes is that it’s a ludicrously short album, clocking in at a mere thirty-seven minutes and counting ten songs. True, the various editions (digipak/earbook/vinyl/etc.) pack a number of bonus tracks (the vinyl release sporting a Manowar tribute song which is a damned lot of fun), but basically you’ve got ten songs and thirty-seven minutes, and that’s it. Of course, this also eradicates the need for any filler material, which results in an album which is as tight as it is short. Musically, Sabaton does not veer much from their trademark sound, if at all. Though the keyboards are toned down on Heroes, and Carolus Rex’s excessive bombast is nowhere to be found, the band delivers pretty much more of the same, and I’m not saying that’s a bad thing. 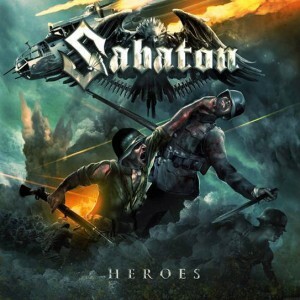 There are some standout songs like the very dark Inmate 4859 or The Ballad of Bull, where the band strays a little into darker or more ballad-esque territory, but the rest of Heroes is pretty much cut and dried Sabaton material. Night Witches is one of the stronger openers the band has put out, and Sabaton is known for having ridiculously good opening tracks. To Hell and Back has a bit of a folkish vibe, and Resist and Bite will surely turn into a live staple, whilst the closing Hearts of Iron is rather moody and features an excerpt from Bach’s Air on a G String. That’s six out of ten songs mentioned; the other four songs aren’t bad, but are rather forgettable, especially considering the sheer amount of memorable songs the band has put out so far. In that aspect, it’s a step back from Coat of Arms and Carolus Rex. On Heroes, Sabaton does what they do best, and that is putting out some fun, bite-sized chunks of European power metal. Fans of the band won’t mind one bit, and will probably have added the album to their collection already, whilst nay-sayers will once again not find anything on there to convert them into fans. A decent Sabaton release, nothing more, nothing less. This entry was posted in RP and tagged 2014, Carolus Rex, Heroes, Nuclear Blast, power metal, review, Sabaton, Sweden, To Hell and Back. Bookmark the permalink.